The generation of a voltage in a conductor when placed within a changing magnetic field. The generation of a voltage in a conductor when it is placed within a changing magnetic field. This happens when a magnet is moved in and out of a conductor, such as a coil of wire. Or when a coil of wire is moved through a stationary magnetic field. So, voltage will only be induced when one of these movements occurs. In power stations, large generators use electromagnetic induction to produce millions of watts of electrical power. Generators induce a current by spinning a coil of wire inside a magnetic field. A potential difference is produced between the ends of the coil, which causes a current to flow from the generator. Electromagnetic induction can also be used to charge devices, like mobile phones, without having to plug them in. In the phone’s charger, alternating current creates an electromagnetic field in a transmitter coil. The field induces a current in the phone’s receiver coil. The phone transforms this alternating current to direct current and uses it to charge the phone’s battery. This happens when a magnet is moved in and out of a conductor, such as a coil of wire. Or when a coil of wire is moved through a stationary magnetic field. So, voltage will only be induced when one of these movements occurs. In power stations, large generators use electromagnetic induction to produce millions of watts of electrical power. 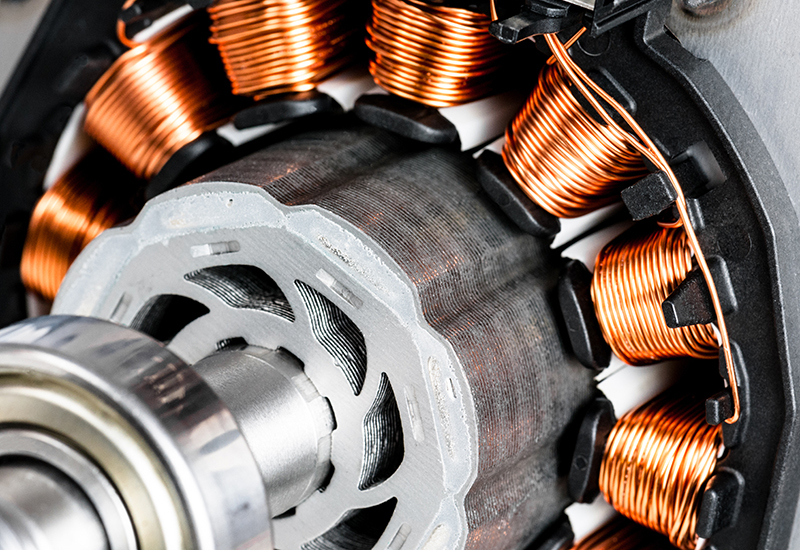 Generators induce a current by spinning a coil of wire inside a magnetic field. A potential difference is produced between the ends of the coil, which causes a current to flow from the generator. Electromagnetic induction can also be used to charge devices, like mobile phones, without having to plug them in. In the phone’s charger, alternating current creates an electromagnetic field in a transmitter coil. The field induces a current in the phone’s receiver coil. The phone transforms this alternating current to direct current and uses it to charge the phone’s battery.